Chad Hoover is a busy guy to say the least, and he is one of the most influential and charismatic guys in the sport of kayak fishing. His credentials are extremely impressive, and he may well be the most recognizable face and personality in the industry today. Chad is a retired naval officer. He was stationed in Texas at Corpus Christi, where he was part of a search and rescue (SAR) unit in the mid to late 90’s. He was out fishing one day, while stationed there, and saw a guy paddling a bait out from the beach to catch sharks. He would later go on to describe this as his, “light bulb” moment, and he soon began going out and chasing fish in the surrounding flats in a kayak – rather than a boat. I have to tell you – that lit a fire in this guy. 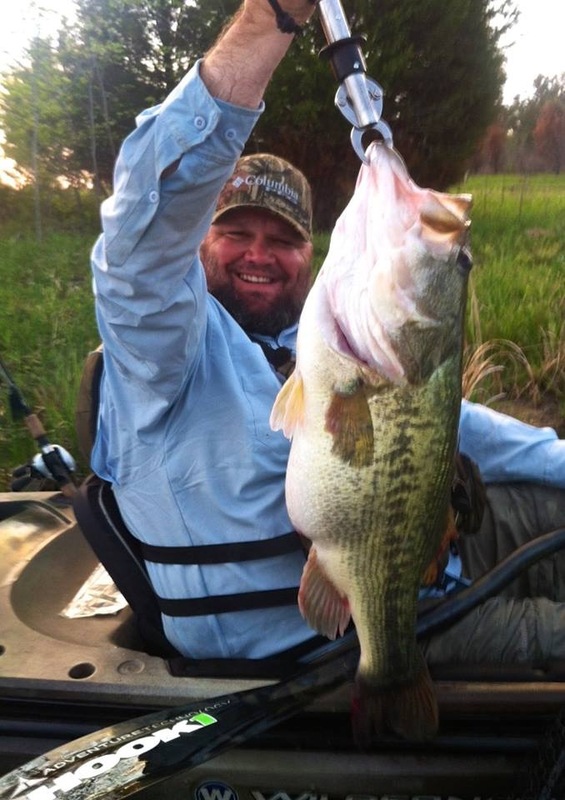 He went on to become an author, and wrote what has been widely called “the definitive guide to kayak bass fishing” titled Kayak Bass Fishing – by Chad Hoover. He soon became a partner at HOOK1, a cutting edge kayak fishing gear store, stocking all the latest and most desirable gear, which has three locations. Chad has also filmed two fishing series, Knot Right Kayak Fishing which ran episodes on NBC, and a newer show KAYAK BASSIN’ TV, which airs on World Fishing Network. He hosts the KBF OPEN yearly, a huge, two-day kayak fishing tournament on Kentucky Lake, which sports hefty, record setting cash prizes in the field of kayak bass fishing, and has also somehow found time to develop CONSEAL – a deadly efficient sound dampening system for kayaks, which he is understandably very excited about. The following interview was conducted by email, text and phone, and transferred into this format. Chad, I don’t even know where to start. You’re head has got to be spinning. How in the world do you find a way to manage all these exciting things at once? Chad – I honestly don’t know for sure. I eat, sleep (very little), and breathe this stuff so it just ends up getting done. I hear you there. I’m sure a dedicated team helps a lot. I know you have several bases to cover, so I’ll start with the 2015 KBF Open. What would you like our readers to know about this year’s tournament? Chad – I’m proud of the fact that we have been able to create a sustained growth for the KBF OPEN. This is our third event and we have the highest payout in kayak fishing history. What we are most excited about is that even with big money up for grabs, we still have an environment of camaraderie, sharing and overall good will. That’s why I love this sport. So how many participants are you expecting this year? And what about payouts and prizes? Chad – Well we have 158 signed up as of right now (March 12th), and there will be multiple cash payouts. That number will be determined by the overall total number of entries. In addition there is an optional Big Bass Pot running all four days which pays $500 in a HOOK1 gift certificate. There is also a Big Bass Prize Package awarded to the biggest bass over the four day period. That winner will receive a Wilderness Systems A.T.A.K., (Advanced Tactical Angling Kayak), a Torqeedo 403 Ultralight Motor and a HOOK1 Outfitting Package. That’s a substantial number of entries already, with very generous payouts and prizes. It sounds like this event is going to be exciting. So will you be competing? And are there any particular anglers you’ll be keeping an eye on? Chad – I’m not, it’s a conflict. I don’t believe in fishing my own tournament. I’ll be keeping an eye on last year’s champ, Jeffrey Hall, and Tennessee State Champ – Craig Dye, as well as last year’s runner up and Big Bass Winner, Ron Champion. And tell me about how this event ties into the 2016 KBF NATIONAL CHAMPIONSHIP? Chad – It’s a qualifier. The top 20, or more depending on entries, are automatically qualified for the 2016 KBF NATIONAL CHAMPIONSHIP. It sounds like this is going to be a huge event. Good luck with everything. I know you want to talk about CONSEAL. Tell me about how this concept came about? Chad – It started when I was fishing with my son, Austin. He would always bang his rod, paddle, lures, pliers or other stuff against the boat. When we were fishing for trophy bass he would spook a big sow after we worked for hours to get a shot at one. So, I had to figure out a way to make him quieter. It started with gluing mouse pads to the sides and on the top deck of his kayak. Later, I found an adhesive foam from a company named Stewart Products. The owner and I became good friends and Chris Stewart is my partner in HOOK1 today. I guess you could say it started it all. Speaking of HOOK1, how is the new location coming along? And what are you most excited about? Chad – It’s going great. We are excited to move to the new location. The building is ideal for our business because of the 100 year old hardwood floors, huge open floor plan, really high ceilings and four times the square footage that we currently have. What I’m most excited about is being on the water, we can run demos right behind the shop. Heck, I can even paddle to work. Well that’s a dream for a kayak fisherman. So do you have a target date for a grand opening? Any sales or promotions to announce for the big day? Chad – Yes we will be opening April 1st. The sale is called, the April 1st You’d Be a Fool to Miss it Sale. I don’t think your customers will want to miss this one. So what’s going on with the new show KAYAK BASSIN TV? Chad – We are filming the KBF OPEN episode right now. And then we film an episode on Kentucky Lake after the tournament. How has the fishing been? And when will episodes start to air? Chad – Fishing is tough right now, but fish are being caught. It rained hard early, but now it’s holding off. Folks can follow all the action live at www.tourneyX.com. And episodes start airing on the World Fishing Network in July. Is there anything else you’d like our readers to know about coming up? Chad – Yes, stay tuned for the upcoming KBF CHALLENGE SERIES Powered by TourneyX.com. It’s the first of its kind, a nationwide live tournament virtual series to qualify for the KBF National Championship. It sounds like everything is going great Chad. I look forward to following all the different things you’re involved with, and I appreciate your time for the interview. You can attempt to keep up with Chad and all he’s involved with by using the links listed below.